Barcelona: One city, two languages. 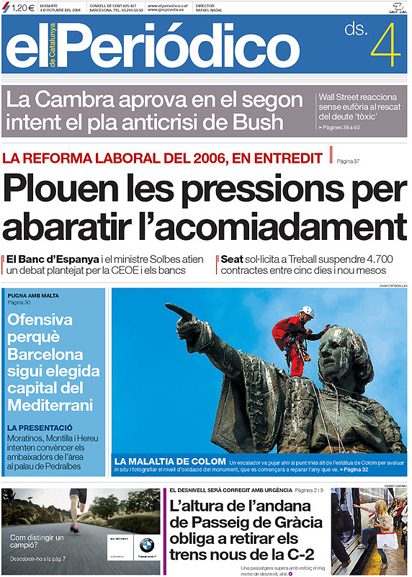 Above: El Periódico de Catalunya, Catalan edition. From Barcelona, Spain. (Via Newseum). 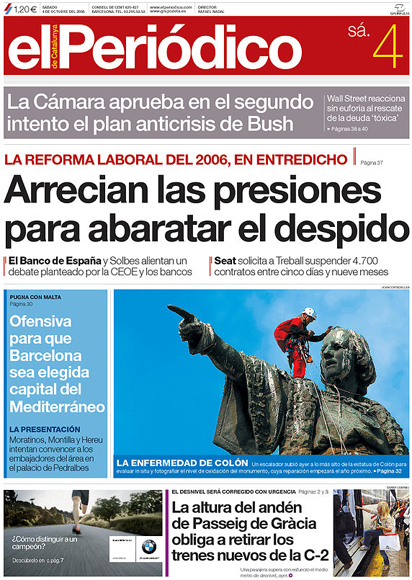 Above: El Periódico de Catalunya, Spanish edition. Above: So near and yet so far. El Periódico de Catalunya, sugoi ne? An interesting typographic challenge! These limitations require linguistic finesse as well as streamlining formal issues. and the Spanish edition in red. Note that the Catalan edition has it’s own web category, (dot) cat! In both versions, the tiny area to the far left of the banner is the clickable language selector. Above: FC Barcelona official club song! Check in with Newseum daily. This entry was posted by Erik Brandt on Saturday, October 4th, 2008 at 10:33 AM	and is filed under Aktuell, Education, Graphic Design, International, News Links, Typografika, Typography.